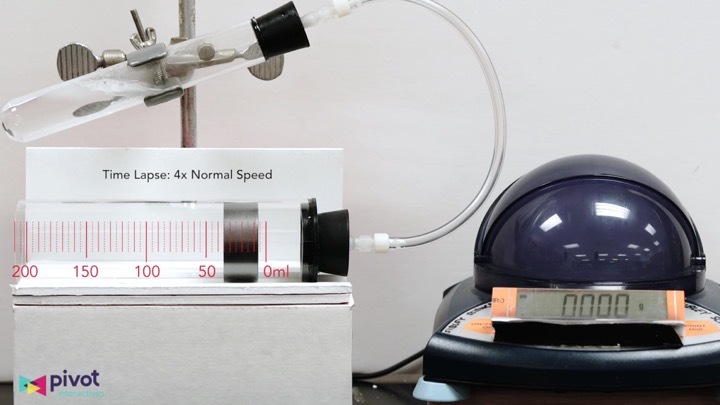 Our collection of magnesium in HCl videos allow students to vary the amount of Mg, vary the concentration of HCl, and measure both the amount of hydrogen gas and the rate of hydrogen gas production. This allows for multiple experimental paths that allow students to discover patterns and connections in their data. Freedom from practical constraints means students can see dangerous, time-consuming, expensive experiments, and multiple trials. Matrices of videos and tools mean students have freedom to create their own questions, and design experiments to answer them. We have six different titration activities, from very basic introductions, to advanced analysis of weak and strong acid/base titrations and titration curves. These are an ideal way for students to learn and practice this essential skill. Rather than rely on a reading from a colorimeter, our colorimetry videos let students perform precise visual measurements of the amount of light transmitted through solutions of various concentrations. Beer’s law is transformed from an abstract concept to a set of concrete observations. —30°C to 35°C. Students decide what to measure and plot, and how to analyze their data. Our thermochemistry activities provide opportunities to experimentally fine-tune apparatus, and identify unknown substances. All our stoichiometry activities provide multiple trials and opportunities for students to reason through possible sources of error. Electrochemistry can be another abstract topic with labs that sometimes produce erratic measurements. Our electrochemistry activities are clear and yield results that will help students understand the processes that underlie these observations. We’re constantly adding new activities to our collection, each with the objective to allow students to make measurements and observations that provide evidence for underlying particle-level interactions.